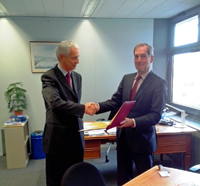 On Wednesday 9 October 2013, the Ambassador of Austria in the Netherlands, Dr Werner Druml, deposited on behalf of Austria the instrument of ratification of the Hague Convention of 13 January 2000 on the International Protection of Adults ("2000 Protection of Adults Convention"). Austria is the eighth Contracting State to join the 2000 Protection of Adults Convention, which came into force on 1 January 2009. The ratification ceremony was also attended by Mr Joseph Damoiseaux, Head of the Treaties Division of the Ministry of Foreign Affairs of the Netherlands, and his colleague Mr Mark Groen, Legal Officer and, from the Permanent Bureau of the Hague Conference, by Ms Kerstin Bartsch, Senior Legal Officer and Mr Lukas Rass-Masson, Legal Officer. The Ambassador of Austria also submitted to the Permanent Bureau the designation of the Central Authority under the 2000 Protection of Adults Convention.